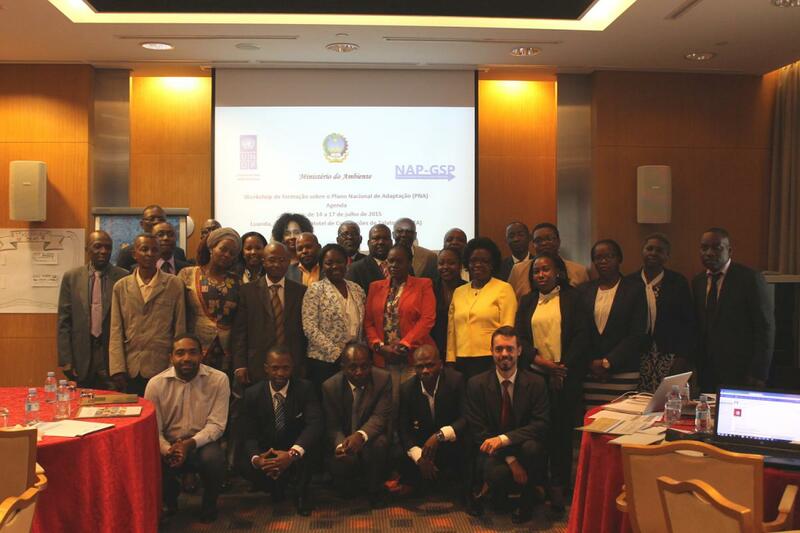 Luanda, Angola, July 2015: The first National Adaptation Plan (NAP) training for Angola was held from 14-17 July 2015, at the Hotel de Convenções de Talatona, initiating the NAP process in the country. The Government of Angola has identified food security, infrastructure development, promotion of green areas and growth of industrial sectors as key development priorities for the country, to be mainstreamed within the NAP process. Twenty-five national experts from various ministries and departments, as well as members of civil society, attended a four-day training on the National Adaptation Plan (NAP) process in Luanda. Present at the opening of the workshop were also the Director of the Cabinet of Climate Change, UNDP’s Country Director and the staff from the United Nations Development Programme (UNDP). The training, which was facilitated by the UNDP-UNEP NAP-GSP team, included sessions on climate information such “Presentation of the NAP work plan or a development of a road-map” and “Understanding the development of the NAP and summary of the NAP” by using the LEG Guidelines on the NAP process interspersed with modules developed by UNDP, Deutsche Gesellschaft für Internationale Zusammenarbeit (GIZ) and UNITAR. The interactive training included a preliminary stocktaking of the institutional actors and pertinent initiatives that could serve as entry points to advance national adaptation preparation in Angola. Angola has recently identified increased risks and climate changes including increasing numbers of hottest days on record, desertification and increasing semi-arid conditions along the south and coastal areas. Higher temperatures are negatively impacting farming through increased evaporation. Institutional challenges to address climate risks in the medium-term include limited availability of concrete data to enable a rigorous estimation of expected climate changes in specific areas of the country and lack of adaptive capacity and resilience. It is necessary to facilitate the integration of climate change adaptation into relevant new and existing policies, programmes and activities to improve resilience and adaptation over the coming years. The multi-stakeholder discussion at the training identified several sectors in which there are viable opportunities for the NAP process to take into account for next steps. These sectors include the Ministries overseeing Fisheries, Oil, Economy, Transport, Industry and Geology. In addition, current NAPA initiatives in Angola such as “Promoting the development resilient to climate and enhancing adaptive capacity to support disaster risk in the River Basin Cuvelai, Cunene" and "Addressing the Urgent Adaptation Needs in Coastal Areas and Strengthening National Capacities” were found to provide a way forward on the NAP process by developing strong partnerships at national and international levels, and initiating evidence-based climate change research. During the workshop, Government departments and institutions made significant strides by identifying priority areas to address climate change issues in Angola. The event signified a start to approaching adaptation and continued to tackle diverse constraints and limits, while detecting new options and opportunities to further progress on the climate change adaptation agenda. The next steps for the NAP process in 2016 will include a high level briefing for decision makers and with long-term planning led by Ministry of Environment (hereinafter MINAMB in Portuguese). The Climate Change department of MINAMB will be crucial for the implementation of the NAP process as the central government body responsible for the coordination, development, implementation and enforcement of environmental policies, particularly in the areas of climate change adaptation.